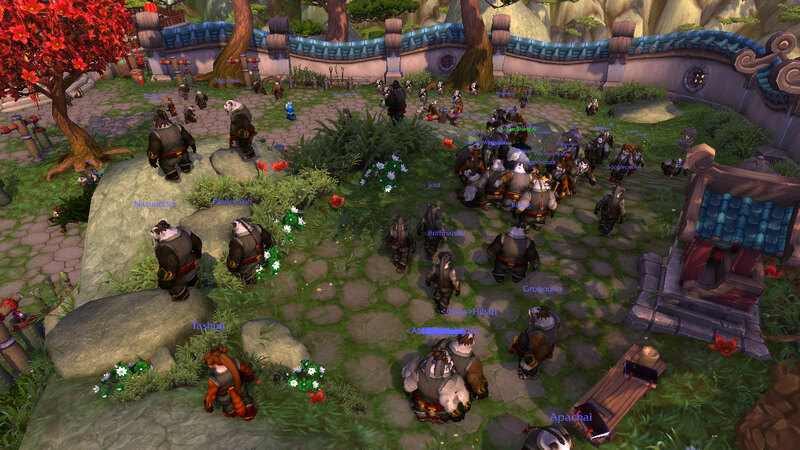 — oh dear lord, that’s a lot of pandaren. I’ll most likely post a fair amount about the beta (especially once my character copies are done and I have something that isn’t a level four pandaren to play). I’ll try to keep spoilers hidden in extended entries so people don’t run into them by accident. Mostly by accident (or so it seemed), I’ve ended up as my guild’s recruitment officer, or at least the closest thing we’ve got to one. Applications to the guild are sent by private message to our guild master and then posted on our private forums for all raiders to comment on, but I’m the one who advertises the guild’s recruitment in the trade channel (because that seems to be the way to get noticed) and attempts to steer people who are interested in the guild in the right direction. This tends to mean I get stupid whispers. A lot of stupid whispers, even discounting the almost daily “wuts the DS buff?” questions. It seems that a lot of people just… have no concept of what it means to be in a raiding guild. So I’ve got this collection of screenshots of whispers, and nothing to do with it. And I figured that a post on the subject could be useful to people who want to get into a decent raiding guild but have no idea where to start (although it’s unlikely to be of much use to the people who don’t understand why whispering an officer with their class and item level, followed by “inv pls”, doesn’t work). I’m by no means the first to do something like this – better writers than me have written similar posts – but why not? So here’s a primer on what to do to get into a raiding guild, by way of screenshots showing what not to do. All names blurred to protect the stupid innocent. If you put in an application to a guild and you don’t receive an immediate response, wait. If you haven’t received a response in a couple of days, feel free to whisper an officer to double-check that your application was received. Do not, however, be the guy who whispers once, waits 30 seconds and then whispers the same thing five more times. Do not be the guy who asks three times a day if a decision has been made on his application, despite having been told the first time he asked that the guild has several applications for the same spot and is trying to make a decision. Do not be the guy who throws a massive hissy fit because the officer you are whispering is slow at responding, when they’re in the middle of a raid.